Tender, flavorful chicken and lots of healthy veggies are the hallmark of this easy meal that can be made in an Instant Pot or slow cooker. Leftover sauce can be enjoyed like your favorite marinara. 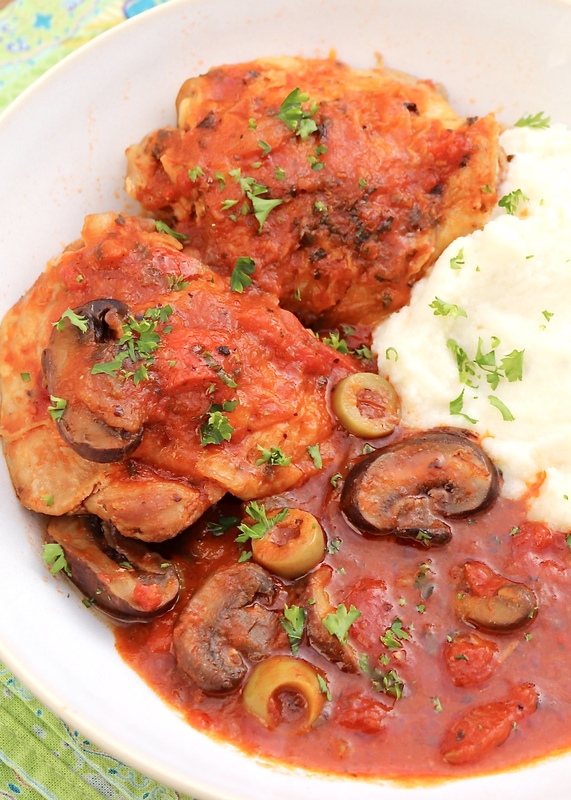 Chicken Cacciatore is a classic. Also known as Hunter’s Stew (“cacciatore” means “hunter” in Italian), there are many different interpretations of the meal. 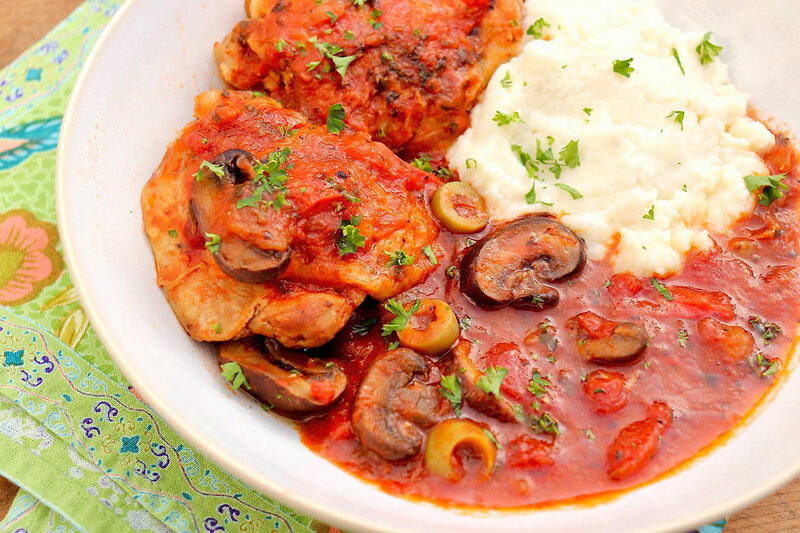 The customary ingredients, however, are sautéed chicken and a reduced sauce including tomatoes, mushrooms, onions, white wine, brandy and tarragon. My version strays slightly from the traditional preparation－but just enough to allow ease and flexibility without sacrificing flavor. Typically cooked low and slow, it is possible to get this flavorful meal to the table quicker with the help of a pressure cooker. Since not everyone has a pressure cooker or an Instant Pot, I’ve tested my recipe to allow for a slow cooker, too. When I mentioned several months ago that recipe testers are always welcome, a number of willing readers contacted me. Several are devoted to their Instant Pots and slow cookers, so this was an ideal recipe to offer. Longtime reader Alexis provided comprehensive feedback and ultimately dubbed this chicken dinner as a winner. Initially, she was met with resistance as, to date, her fiancé had proclaimed that he was not a chicken cacciatore fan. Alexis thought the finishing touch of balsamic vinegar added “a ton of flavor.” Having arrived home late from work, she opted for the cornstarch slurry trick (instead of taking the time to reduce the sauce), and said the sauce thickened up nicely. Traditionally served over polenta, my family enjoys it with mashed potatoes, although pasta (as Alexis used), rice or cauliflower rice work well, too. Optionally, enjoy it as a stew with a crusty piece of bread. Depending on how you ladle out this dish, you may end up with a good amount of leftover sauce. In that case, shred whatever amount of chicken remains and use as you would your favorite pasta sauce. Even if all the chicken has been picked out, I think you’ll find the sauce too flavorful to discard－and a welcome component for a future meal. Helpful hint: When possible, chop the vegetables in advance and store in refrigerator to make things extra easy at dinnertime. 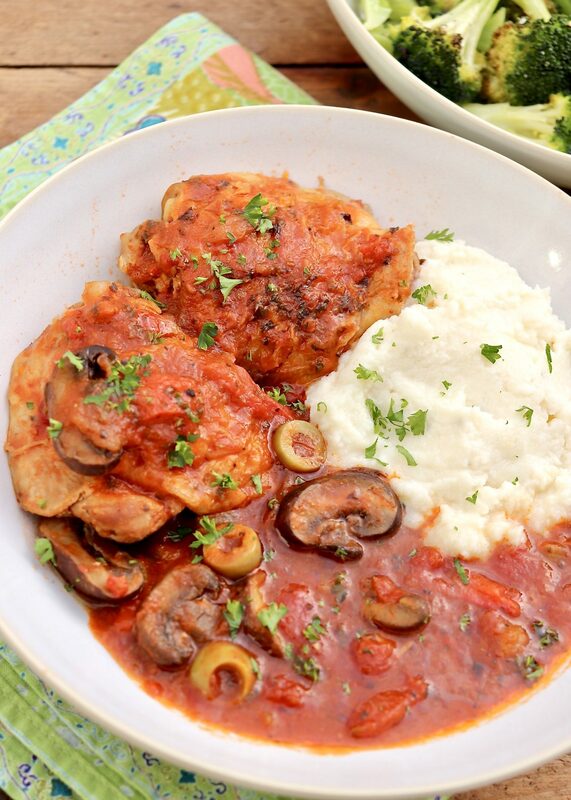 Tender, flavorful chicken and lots of healthy veggies are the hallmark of this easy meal. Leftovers improve with age and any remaining sauce can be enjoyed like your favorite marinara. Heat the oil in the pot of an electric pressure cooker (like an Instant Pot) on “Sauté” mode. Add the chicken, and cook skin side down, about 6 minutes or until nicely browned. Flip the chicken pieces and sear for another 5 minutes to lightly brown. Transfer the chicken to a plate, reserving the drippings in the pot. Add the mushrooms, bell pepper if using, celery and onion to the pot. Cook and stir until somewhat tender, about 5 minutes. Add the garlic, and cook until fragrant, another minute or so. Place the chicken back in the pot. Add the stewed tomatoes and tomato paste. (I squish any large tomato chunks with my hand.) Sprinkle with the Italian seasoning and optional red pepper flakes. (You can also add a few grinds of black pepper if you wish.) Pour in the bouillon/water mix. Close and lock the lid. Select high pressure according to manufacturer’s instructions. (Allow 10 minutes or so for the pressure to build.) Cook for 11 minutes. 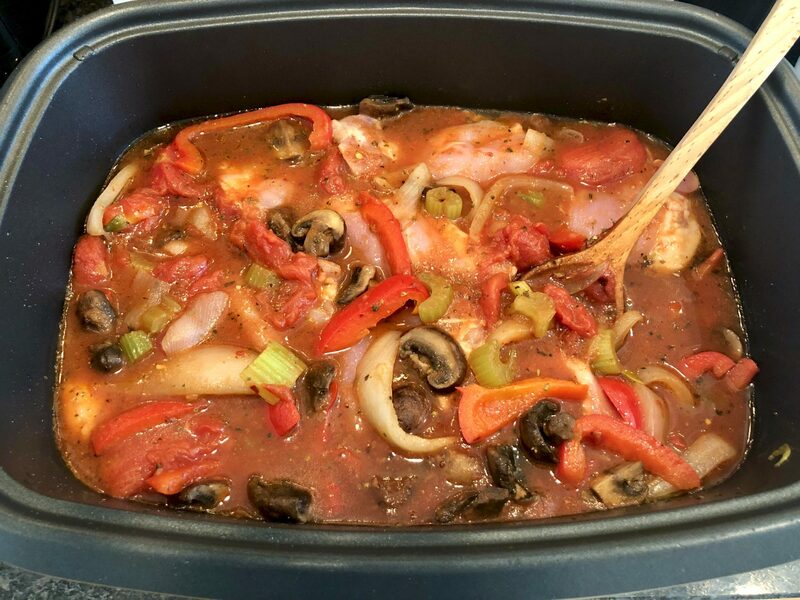 Slow Cooker option: I have prepared this meal in my slow cooker with good results. In this case, follow the recipe as written, sautéing the chicken and veggies in a separate pan on the stovetop and then transferring to the slow cooker if your cooker does not have a sauté option. The precise cooking time will vary somewhat based on size of cooker used, but it will likely take 4-6 hours on low, or half that on high. In order to thicken the sauce, remove the chicken to a plate and then cook on high heat for 30-60 minutes or until thickened to your liking. Add the chicken back in after stirring in the olives and balsamic vinegar. When slow cooking, I do go slightly scant on the 2 teaspoons of herbs and follow the other details as written above. **An equal amount of chicken broth could be used in place of the water and Better than Bouillon. In this case you may wish to add an extra pinch of salt at the end. •You could also add some capers, use herbes de Provence instead of the Italian seasoning and/or vary the vegetables according to what you like and have on hand. •Traditionally served over polenta, my family enjoys this meal with mashed potatoes, although pasta, rice or cauliflower rice work well, too. Optionally, enjoy it as a stew with a piece of crusty bread. I thought this recipe looked familiar! Tasty and easy to prepare. Hi Alexis! Thank you again for your efforts and all the helpful feedback! This looks so good! I think I need to try this. Neither my husband or myself care for dark meat chicken but I might have to try skinless thighs for this. I love my instant pot and I need to try some new recipes for it. Thank you!! I will try with the chicken thighs. I need to get to grocery tonight so that is on my list. WE loved this one Ann! I made it last night and it is a winner!! Really easy to make as well. Hubby went back for seconds. I wound up using boneless and skinless chicken thighs, there were 5 or 6 in package and they were smaller but it was around 2 lbs. I used sliced black olives and put in some cornstarch to thicken and I added balsamic vinegar because well, that gives so much flavor! It felt good to get in the kitchen and cook, so thank you for the recipe! Now I need to calculate the Weight Watcher points for it! Thank you for taking the time to check back in with your wonderful feedback, Mary Lou. I’m thrilled it was a success and love the photo you posted on Facebook. Everyone needs fun plates like that!